Welcome to the fourth edition of the “Women Challenge”! 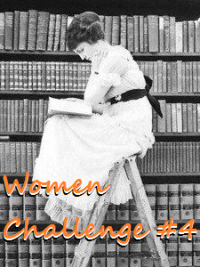 This challenge will make us want to read more books of any kind written by women, so choose whatever you like and get involved! Set your level and, if you like, leave me a comment on this post listing your three favourite women writers, in order to suggest new names to other participants as well. Benvenuti alla quarta edizione della "Women Challenge"! La sfida ci invoglierà a leggere più libri scritti da donne, di qualsiasi genere siano, scegliete pure quello che preferite e partecipate! Decidete il vostro livello e, se vi va, lasciatemi un commento a questo articolo elencando le vostre 3 autrici preferite, in modo da suggerire nuovi nomi anche agli altri partecipanti. * la sfida durerà dal 1 gennaio 2016 al 31 dicembre 2016. * a questo link trovate il post in cui linkare tutte le vostre recensioni relative alla sfida. Non è mai troppo tardi per partecipare! 1) Fleur Jaeggy "I beati anni del castigo"
2) Amelie Nothomb "Stupore e tremori"
3) Dorothy Parker "Dal diario di una signora di New York"
4) Elizabeth Strout "Olive Kitteridge"
5) Mara Barbuni "Elizabeth Gaskell e la casa vittoriana"
6) Maria Rosaria Ambrogio "Un patto tra voci femminili Artemisia di Anna Banti"
7) Vanda Finocchi "Ridere è cosa seria Tre uomini in barca (per tacer del cane) di Jerome K. Jerome"
8) Giuliana Tedeschi "Memoria di donne e bambini nei lager nazisti"
9) Francesca Blesio e Giorgia Olivieri "Grand Tour Bologna"
11) Charlotte Brontë "Ma la vita è una battaglia"
12) Zadie Smith "Perché scrivere"
13) L. Littizzetto e F. Valeri "L'educazione delle fanciulle"
14) Jennifer Egan "Scatola nera"
15) Christa Wolf "Che cosa resta"
16) Banana Yoshimoto "Il coperchio del mare"
18) Camila Raznovich "Lo rifarei!" 20) Christa Wolf "Nessun luogo. Da nessuna parte"
22) Joyce Carol Oates "Zombie"
23) Paula Hawkins"La ragazza del treno"
Love this challenge! So happy to take part again! Happy reading to all! Thank you for your recap and happy reading in 2016! Contano solo i libri che comincio già dopo il 1 gennaio? Questa sfida mi ispira moltissimo, è la prima volta che partecipo e scelgo il livello 3...spero di farcela! Here's my list from 2015; reviews just didn't happen. Will be signing up for 2016! Forgot to link my reviews last year, but the challenge itself was a lot of fun! I love the idea of reading more women authors. Thanks so much for hosting this challenge. I'm going to try the "Super Girl" level. Oh, and my three favorite women writers are Barbara Pym, Muriel Spark, and P.D. James. I love this challenge. My three favourite female authors are Lauren Oliver, Jessica Khoury and Laini Taylor. But there are tons of others that are amazing too. This challenge has made me much more aware of the make up of my reading list. It started with gender but is expanding, slowly, because as an elderly white cis woman I have to hunt for books I want to read then get creative to actually get them into my hands. I hope to have a far more inclusive list this year. E a fine Novembre mi accorgo anche io che posso partecipare a questa iniziativa! Jane Austen, Amelie Nothomb, Fred Vargas. My goal was to reach the Baby Girl level, but I made it to Girl's Power with 15 books read and reviewed. Proud of myself! Thank you for hosting this challenge!